The former Fuddruckers restaurant at the Tradewinds plaza in Ellsworth left only a letter on its door announcing its closure this week after about three years of business there. ELLSWORTH, Maine — The Fuddruckers restaurant chain that claims to sell “the world’s greatest hamburger” has ended its first attempt at establishing a northern New England outlet. Postings on the Ellsworth restaurant’s Facebook page and the front door of its former State Street storefront at the Tradewinds Market plaza announced the closure. A tweet from Gov. Paul LePage on Tuesday addressed the closing and took a swipe at the Legislature. People who responded to the posting on the page lamented the end of the Ellsworth eatery. But many attributed the closure to Fuddruckers’ high prices, not the economic and political factors LePage cited. “Oh no! We love Fuddruckers! Sorry to see you go,” another said. 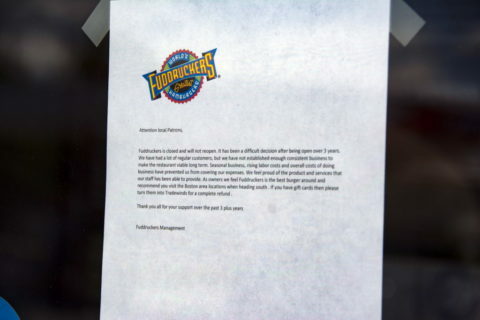 A man and woman who said that they had traveled from Alaska on their way to Southwest Harbor on Tuesday were disappointed to find only a letter on the door of the Ellsworth Fuddruckers restaurant announcing its closure this week. 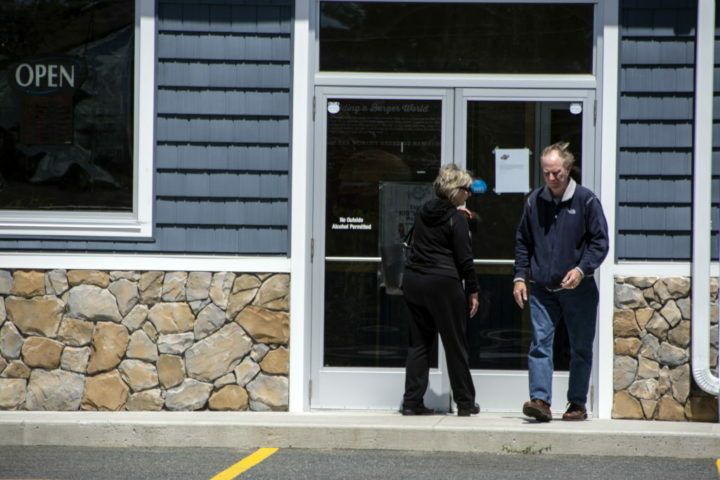 Despite the sign being stripped from the front of the restaurant at the Tradewinds plaza on Tuesday, a man and woman, who said they had traveled 14 hours from Alaska on their way to Southwest Harbor, still approached the front door before leaving. Owned by Luby’s Inc., of Houston, Texas, Fuddruckers listed 110 franchise locations on its website. That includes 67 in the U.S., including Puerto Rico, with the rest in Canada, Mexico, the Dominican Republic, Panama and Colombia. 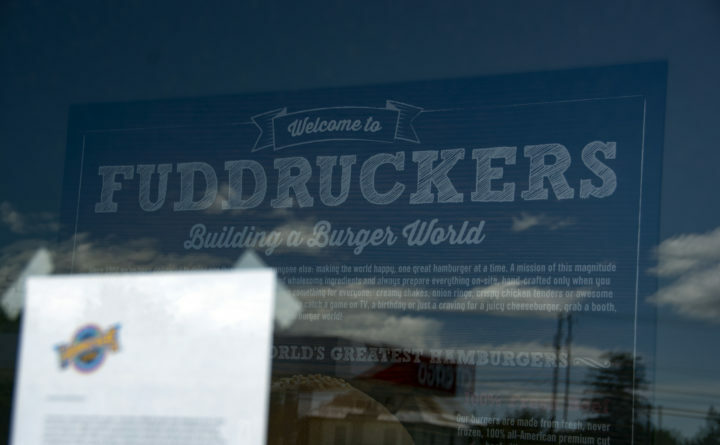 Fuddruckers has four stores in Massachusetts and three in Connecticut, according to its store locator. The Ellsworth restaurant opened at a Tradewinds store in spring 2015. The 9,500 square-foot building included a Tim Hortons restaurant and was anchored by a Tradewinds convenience store and gas station similar to other Tradewinds stores. The building’s owner at the time said that he sought out Fuddruckers. The company was initially skeptical of expanding to northern New England, he said, but managers were quickly convinced after he showed them how much seasonal traffic passes the location en route to Bar Harbor and Acadia National Park. Fuddruckers sales at company-owned restaurants decreased $2.9 million versus the second quarter fiscal 2017, according to an earnings release on its website. The company attributed the downturn to eight restaurant closings and a 6.4 percent decrease in same-store sales that was the result of a 11.8 percent decrease in guest traffic.